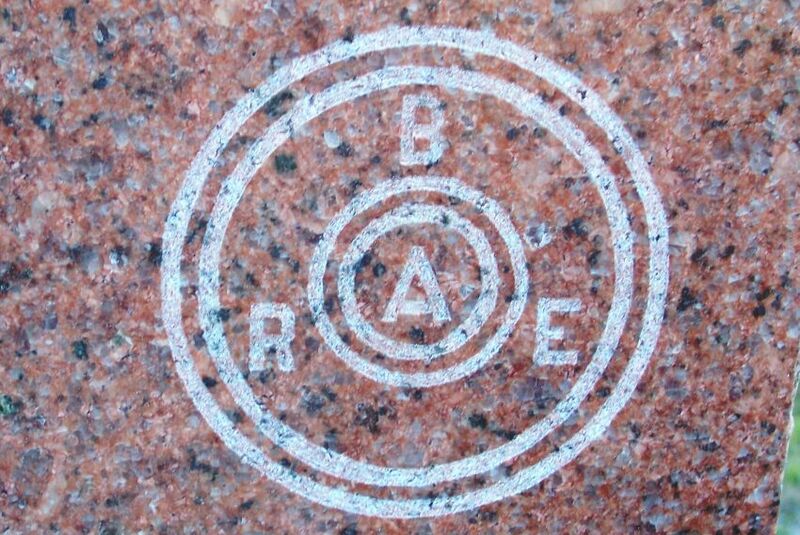 I enjoy looking for and photographing unusual insignia on tombstones. The two images on the Beach tombstone are ones that I show in my “Rocks of Ages,” tombstone art and cemetery research presentation. 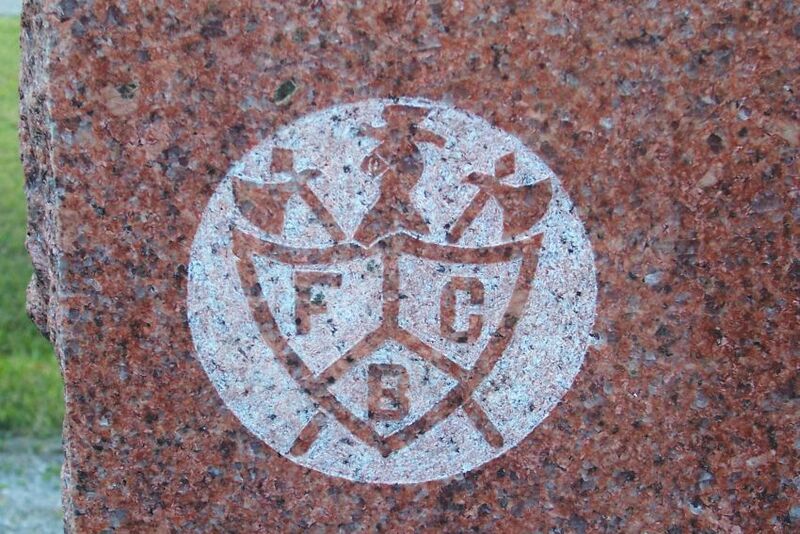 The emblem on the left is not unusual on tombstones in this area and is the insignia of the secret fraternal society Knights of Pythias, which was formed in 1864. 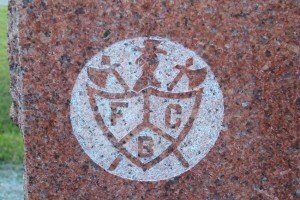 The letters on the shield are an acronym for the society’s motto, Friendship, Charity and Benevolence. 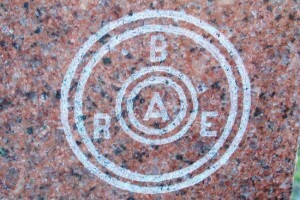 The emblem on the right is much less familiar and took some research to discover that it is the insignia of the Benefit Association of Railroad Employees. 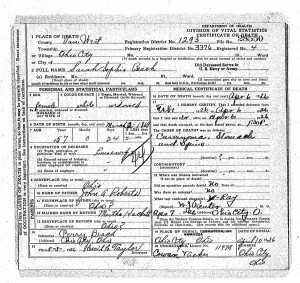 Franklin H. Beach, Ohio death certificate, 1922. 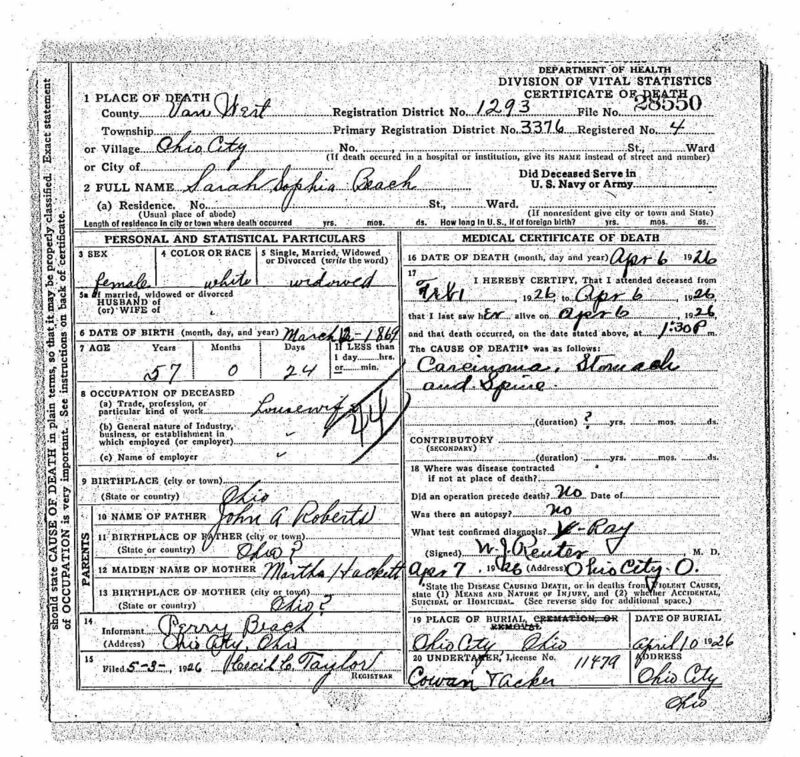 Sarah Beach, Ohio death certificate, 1926. 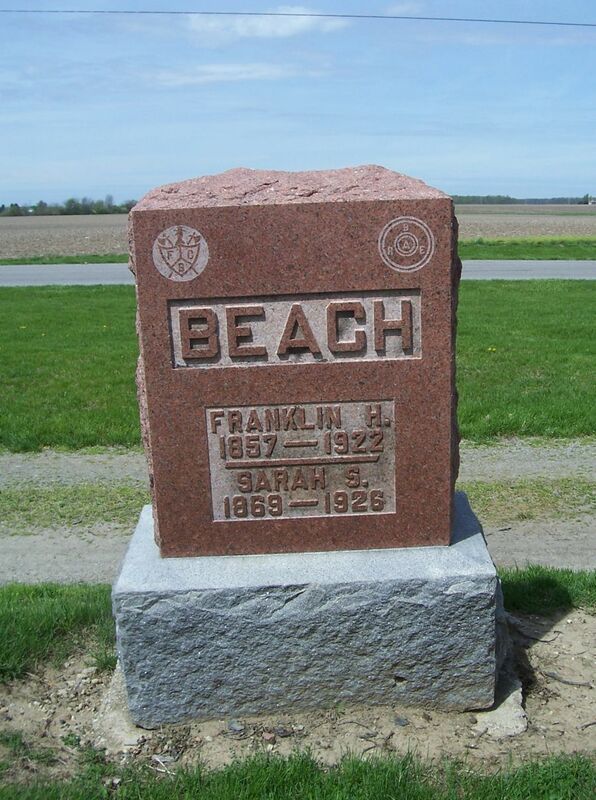 “Ohio, Deaths, 1908-1953, Index and images,” database, Family Search (https://familysearch.org/pal:/MM9.1.1/X8RZ-7HT : accessed 2 June 2013), for Franklin Huriah Beach, Registration District No 1293, (1922). The Ohio City Progress, Ohio City, Ohio, Nov 17 1922 p. 1. 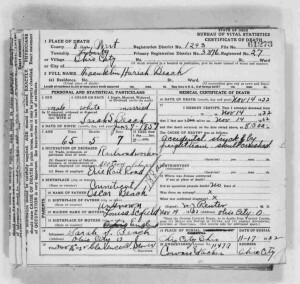 “Ohio, Deaths, 1908-1953, Index and images,” database, Family Search (https://familysearch.org/pal:/MM9.1.1/X6C6-NFF : accessed 2 June 2013), for Sarah Sophia Beach, Registration District No 1293, (1926). Interesting story of such a tragic passing, yet similar to one that I overheard in the Town Pump in Willshire as a child. Being struck by a train apparently was not that uncommon back in those days. In passing, a person commented how physically similar I looked to my Great Grandfather recently. Since I had not even considered the idea myself, I was astounded that anyone else might have seen my Great Grandfather and made such an observation. They then revealed that they had done a Google search and come up with his picture. Now where would his picture be posted that Google could locate it? Why, it was on Karen’s Chatt! What incredible reach a simple blog posting can have. Yes, it is amazing to consider how far-reaching the blog posts are. I have been contacted by people from around the world–distant relatives and others with a family connection. I don’t know who will read a post or when they will read it. 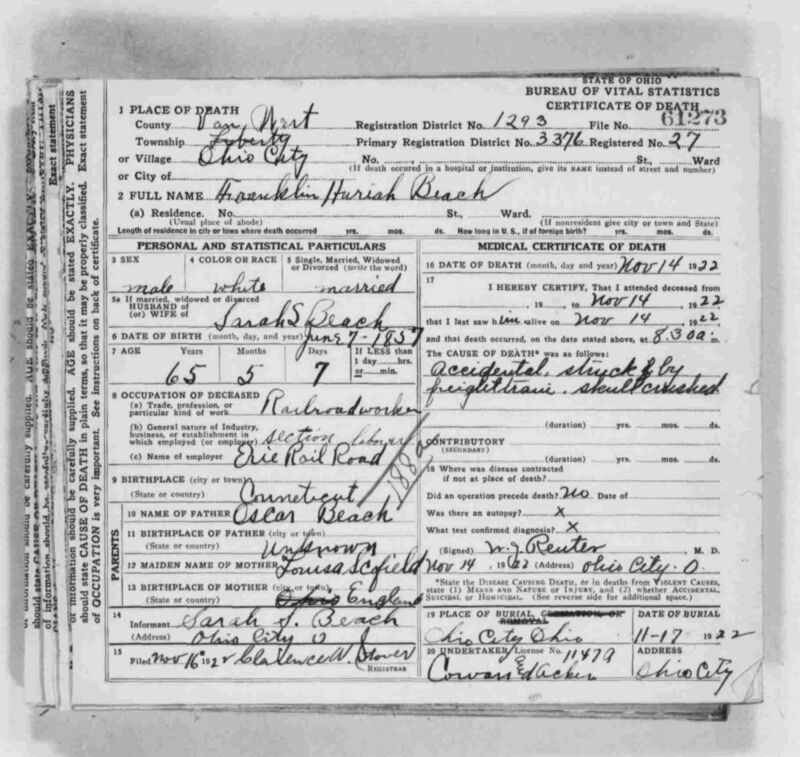 I hear from people that have just found a family connection or a common surname in an old post via a Google search. I am not sure how I happened upon this particular page. It was exactly what I was looking for. 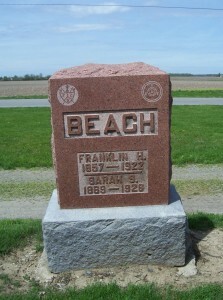 Frank Beach was the grandfather of my sister-in-law, Sarah (Sally) Beach Mcconn. She was thrilled to see this. Thank you so much for sharing this family information. You are welcome. I am so glad you found the information useful and interesting. Thanks for writing!